Does the 2016 Chevy Malibu Price Include What Drivers Want? For drivers in the market for a new sedan, will the 2016 Chevy Malibu price give them everything they want? As consumers search for the perfect car, pricing is a big consideration, as is value. Buyers browsing and comparing the latest models may feel torn between a car like the Malibu and a popular model like the 2016 Honda Accord. Which vehicle offers the biggest bang for your buck and the prime features you want most? For some clarity in this debate, come along with us as we compare pricing and amenities for the Accord and the Malibu. A clear winner emerges—but which nameplate will it be? In terms of cost, the Accord and the Malibu are very close at the base model level, but the difference in amenity offerings between the two vehicles is huge. 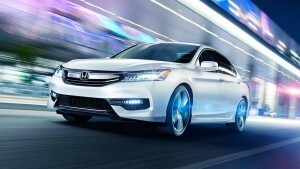 In terms of what drivers will get for their money, the Honda Accord pulls far ahead of the Malibu. Many amenities come standard onboard the Accord for the base-model price that are not offered in the base-model Malibu, including a multi-angle rearview camera with dynamic guidelines, dual-zone automatic climate control, Bluetooth wireless connectivity, automatic headlights, a one-touch power driver’s window, a CD player, an exterior temperature gauge, and alloy wheels. Drivers can explore the other winning attributes of the 2016 Honda Accord at any Central Illinois Honda Dealers location. Stop by and see us or contact us today to take a test drive onboard this exceptional sedan. 0 comment(s) so far on Will the 2016 Chevy Malibu Price Buy the Premium Amenities You Want?